Microbial resistance against disinfectants solutions used for cleaning the pharmaceutical manufacturing facilities. Resistance in microbes against the disinfectants used for cleaning is a serious issue in pharmaceuticals but in most of the pharmaceutical manufacturing units, it is ignored. Continuous use of same disinfectants may lead to the development of resistance against disinfectants in the microbes. We test disinfectants for their efficacy using normal microbars but we don't use resistant strains. Therefore, it is important to concentrate on the development of resistance against disinfectants in our environmental isolates. Most of the microbes develop defense mechanism against the disinfectant solutions. Pathogenic bacteria staphylococcus aureus develops some protein those helps to pump out the toxins from the cell to protect itself. The main cause of the development of resistance against disinfectants is the use of low concentration of the disinfectants for cleaning the floor. Some pharmaceutical manufacturers use less concentrate disinfectant solutions than recommended by the manufacturer. This will not kill all microbes present on the floor. Only weak microbes are killed and strong remain alive. After repeated use of this disinfectant, the population of these strong or resistant microbes will increase and this situation can be dangerous for the products manufactured in the facility. These microbes contaminate the products during the manufacturing and packaging. Disinfectant used for any purpose should be changed weekly. This will also happen upon the use of the same disinfectant solution for a long period. When we use the same disinfectant for a long time it shall help to increase the population of resistant microbes. But when we use two or more disinfectants, microbes resistant to one disinfectant shall be killed by another one. Disinfectants used for cleaning must also have a different active agent. Sometimes it is seen that companies are using different brands of disinfectants but they have the same active agent. It must be checked after a time interval that all microbes are being killed by the disinfectants. 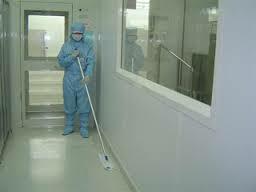 The floor should be cleaned with the disinfectant and sample should be taken by swab or contact plate. Same microbes should be detected after disinfection of different disinfectant solutions. It should be implemented in all manufacturing facilities to identify the resistant microbes.